1.Cut the paneer into cubes and keep aside. Slice the onions thinly lengthwise. Chop the capsicum into bite size pieces. Chop the green chillies. 2. Heat oil in a kadai. Add onions and chillies and saute until transparent. 3.Add the ground paste, dhania powder and garam masala. 4.Simmer until the sauce is reduced and oil floats on top. 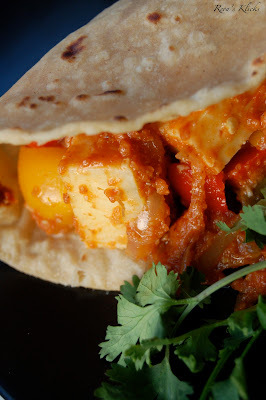 5.Add the paneer and capsicum and cook for 4-5 mins. 6.Check salt and serve hot with rotis. My blogging marathon buddies: Priya Vaasu , Srivalli , Priya Suresh , Monika , Azeema , PJ , Jay , Ayeesha , Soumya.....Check them out. Mmmmm....My fav too!!! The kadai looks simply perfect!!! This is my favorite too...simple yet so flavorful! Kadai paneer looks gorgeous.. love to follow u! the way you present the recipes wow!looks delicious. Hi Reva, I am so glad that I could visit ur space, following u now. The paneer looks utterly delicious. Have sent u a mail regarding the event hosting. lovely.... my fav. i make it a little bit differently. urs look enticing. nice clicks!